If you have a Home Owners Association, you most likely signed a Covenant when you moved in. Most HOA's charge a fee for maintaining and looking after the outside of buildings and the landscaping. This means that the fee that you pay every year goes towards painting, fixing fencing, mowing lawns and so on. In many cases, the HOA has signed a contract with a local landscaping company who owns the equipment used to maintain the gardens and lawns. Agreements like that are generally worded to be unbreakable, and the inertia created by this carries along with it the lack of will to change. As a member (you own a house or condo in the complex or subdivision) you also have a voice. If you're not going to the meetings and airing your ideas, this is the place and the time to do it. Get involved in the process. Create a group amongst the other home owners; a bigger voice will be heard. Start a garden group of proud HOA members - otherwise known as 'Community Building'. Gather your ammunition; a slideshow of great xeriscaped gardens will go a long way towards educating, while entertaining. Be enthusiastic! Be prepared for the momentum to take a while; Xeriscaping is not built in a day, it's a mindset. Start slow, and be patient; plant up some containers with succulents to demonstrate your affection for these great plants. Play the guilt card; if you use less water to maintain thirsty gardens and landscapes, there will be more to grow food. Or, use the mention of grandkids to get them to allow landscaping with less water; bees and butterflies need food too, and most drought tolerant plants are great fodder for pollinators. Think, future gardeners and farmers. If you do get a half-hearted agreement, start small - ask if you can put in a demonstration garden to display what it will look like. People will be amazed and delighted by the bright colors and the butterflies and birds it attracts, and become your best advocates. The UnH2O Garden in Kelowna B.C. Sometimes, it's necessary to be a little bit discreet. This is not to say that you need to be subversive. Getting any bureaucracy to change is a bit like getting the Titanic to change course. It takes a lot of effort, and more time than you think. When you see the guys show up with the mowers to mow the acres of pristine (water guzzling) lawn, run out to the parking lot and jot down the name of their employer from the side of their truck. Most likely, it will also have the phone number. Armed with that, go to the nearest phone (out of sight) and call the company, and pretending total ignorance, ask to speak to someone who will give you a quote. When that person (usually one of the partners, if it's a larger company) comes on, introduce yourself and say that you're a member of your HOA. If they exclaim that they do the maintenance at the very HOA that you are a member of, express surprise. Ask them if they do any xeriscaping, and if they ask you why, just explain that you're doing some research for a potential client. 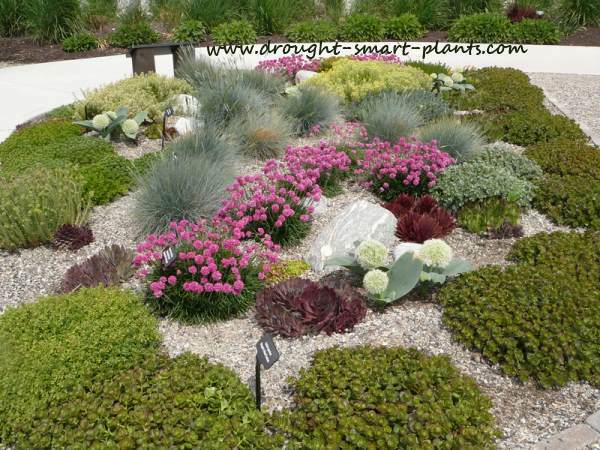 If they say that they do xeriscaping, ask if they would mind giving you addresses of local clients (or ask to see their portfolio on their website, which saves you a trip). In the off chance that they don't have any experience in this type of landscaping, ask them to refer you to some other contractors that do. Chat for a bit, then tell them you'll get back to them. Rinse and repeat, until you find some good quality landscapers that actually know what you're talking about. Visit the gardens they have xeriscaped, take lots of pictures, with the garden owners permission, and tell them what you're doing - trying to get your HOA to see the light. Now you have the ammunition you need; not only do these companies actually build and maintain beautiful xeriscapes, you have the pictures to prove it. 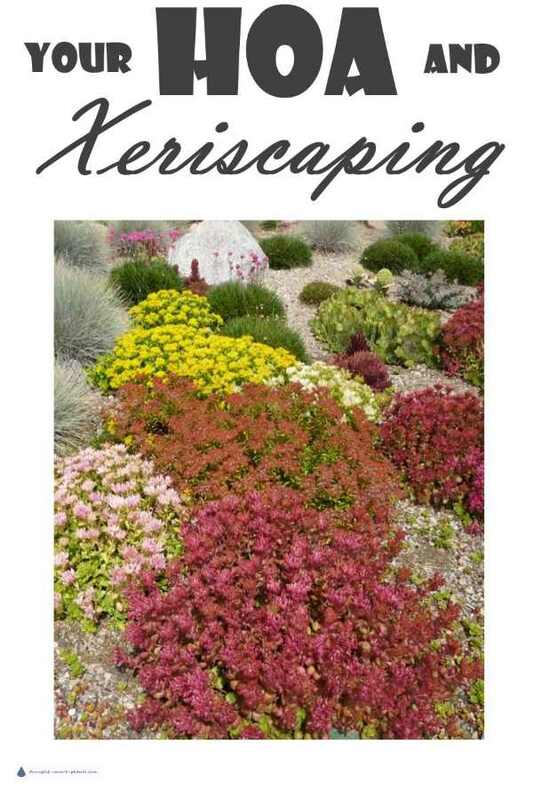 There are lots of books that I found extremely useful when I was researching xeriscaping and delving into all the intricacies of setting it up in my own garden.